Phallaceae is a family of fungi, commonly known as stinkhorn mushrooms, within the order Phallales. Stinkhorns have a worldwide distribution, but are especially prevalent in tropical regions. They are known for their foul-smelling, sticky spore masses, or gleba, borne on the end of a stalk called the receptaculum. The characteristic fruiting-body structure, a single, unbranched receptaculum with an externally attached gleba on the upper part, distinguishes the Phallaceae from other families in the Phalalles. The spore mass typically smells of carrion or dung, and attracts flies, beetles and other insects to help disperse the spores. Although there is great diversity in body structure shape among the various genera, all species in the Phallaceae begin their development as oval or round structures known as "eggs". According to a 2008 estimate, the family contains 21 genera and 77 species. 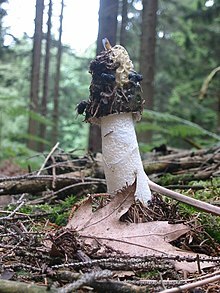 Species of stinkhorns have gasteroid, or internally produced spores. Fruit bodies originate as a gelatinous, spherical, or egg-shaped structure that may be completely or partially buried underground. The peridium, the outer layer of the egg, is white, or purple/red, with two or three layers. The outer layer is thin, membranous, and elastic, while the inner layer is thicker, gelatinous, and continuous. At maturity, the peridium opens up and remains as a volva at the base of the receptaculum. The fertile portion of the fruiting body is often borne on the end of a wide, fleshy or spongy stalk (as in the Phallales), which may be cylindrical, star-shaped, or reticulate (forming a network). They may be brightly colored, sometimes with a lattice- or veil-like membrane enclosing and protecting the spores. The spore-containing substance, the gleba, is typically gelatinous, often foul-smelling, and deliquescent (becoming liquid from the absorption of water). The gleba is formed on the exterior face of the cap or the upper part of the receptacle. The basidia are small and narrowly club-shaped or fusiform, short-lived (evanescent), with four to eight sterigmata. The spores are usually ellipsoid or cylindrical in shape, hyaline or pale brown, smooth, more or less smooth-walled, and truncated at the base. Fruiting bodies have a short stalk from which arises a spore-bearing structure (the receptaculum) of 5–8 arched arms. These arms, initially joined at the top, disconnect and curve irregularly to expose the inner surface of each arm, which is covered with green spore-containing gleba. Spores are 3–4 × 1–1.5 µm. Mature fruiting bodies contain a roughly cylindrical white or pinkish stalk approximately 6 × 2 cm, with a volva at the base. At the top is a bright red disc with a variable number of arms, typically 3–7 cm long. The gleba found on the disc and inner side of the arms is slimy, foetid, and green colored. Spores are hyaline, with dimensions of 4–6 1.5–2 µm. Aseroë rubra, an Australian and Pacific species which has spread to Europe and North America. 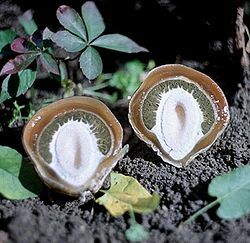 Fruiting bodies are latticed (clathrate), and made of hollow tubular arms that originate from the basal tissue within the volva. Spores are elliptical, smooth, hyaline, with dimensions of 4–6 ×1.5–2.5 µm. Examples include Clathrus ruber, the lattice stinkhorn, Clathrus archeri, the octopus stinkhorn, and Clathrus columnatus, the columned stinkhorn. A genus of four species with fruit bodies that are a short stalk from which six columns arise, joining at the top to form a red, arching, clathrate receptaculum. The gleba is smeared on the inside surface of the receptaculum. Contains a single species, E. yunnanensis found in China, that resembles Phallus except for a peridium that is separated from the base of the stem and which does not persist as a volva. Fruiting bodies are latticed (clathrate), and have gelatinous arms that lie sessile within the volva. Spores are elliptical, and have dimensions of 4–6 1.5–2.5 µm. The New Zealand native, Ileodictyon cibarium, known as the basket fungus, has a fruiting body shaped somewhat like a round or oval ball with interlaced or latticed branches. Characters in this genus include a white calyptra (tissue which covers the top of the fruiting body to which the gleba is attached), lamellate plates covered with gleba. The gleba has a white mottled surface, and the pileus appears wig-like when removed of the gleba. The thick, stout stalk has many chambered walls. This genus circumscribes the single species Kobayasia nipponica, found in Japan in 1958. Fruiting bodies are 4.5–6.5 cm long, 2.2–5 cm in diameter, and have four or five thick white chambered arms that are joined at the top, but free at the base. This monotypic genus, containing the single species L. rodrigueziana, is known only from Costa Rica. Fruiting bodies consist of a long stalk with 3 or 4 short, thick arms. These arms, initially joined together, but usually separate at maturity, are covered with the brownish-olivaceous gleba. Spores are ellipsoidal, with dimensions of 4–5 × 1.5–2 µm. The mature fruiting body has a spongy, cylindrical hollow stalk which ends in a slender, tapered, sometimes curved head covered with the dark olivaceous, slimy gleba. In older specimens, the gleba may be washed or worn off to show the orange or red color of the head itself. Notable species include the dog stinkhorn Mutinus caninus. This genus contains the single species Neolysurus arcipulvinus, described from Costa Rica. The stipe and arms have a tubular construction, similar to species from Lysurus. Neolysurus is unique in having a long stipe, ending in arms or columns that branch and interconnect to support a cushion-shaped, olive green gleba. The glebal cushion is divided into polygonal compartments by a fine pinkish white, solid mesh. The hymenium is continuous between the mesh. In species of Phallus, the receptaculum is a tall unbranched stalk that ends in a cap-like structure that bears the gleba. Notable species include Phallus impudicus, the common stinkhorn, Phallus hadriani, Phallus ravenelii, and Phallus indusiatus (syn. Dictyophora indusiata), the Chinese "bamboo fungus", eaten as a food in southwestern China after the foul smelling cap is removed. Fruiting bodies are egg-shaped, 2.2–3.5 cm in diameter by 3–4 cm high, with a dull white, soft exoperidium (roughly 1 mm thick) and a grayish exoperidium (3–4 mm thick). The gleba is contained within internal chambers that are separated by whitish, gelatinous tissue that originates from a columella-like, gelatinous central core. Spores are elliptical, smooth, nearly hyaline, and 3.5–4.5 1.5–2 µm. This genus resembles the Protubera, except that the tissue is "gelatinous fleshy in the peridium and not so distinctly gelatinous as in Protubera maracuja, they are less gelatinous in the nature of the sterile strands than those of P. maracuja". Spores are clylindric, thin-walled, and 3.7–5 2–2.5 µm. This monotypic genus contains the single species Protuberella borealis, known only from Asia. ^ "Clathraceae Chevall. 1826". MycoBank. International Mycological Association. Retrieved 2010-08-06. ^ "Lysuraceae Corda 1842". MycoBank. International Mycological Association. Retrieved 2010-08-06. ^ Kirk PM, Cannon PF, Minter DW, Stalpers JA (2008). Dictionary of the Fungi (10th ed.). Wallingford: CABI. p. 519. ISBN 978-0-85199-826-8. ^ Jülich W. (1982). Higher taxa of Basidiomycetes. Bibliotheca Mycologia 85. Cramer, Vaduz. 485 pp. ^ Cannon PF, Kirk PM (2007). Fungal families of the world. Wallingford: CABI. p. 270–1. ISBN 0-85199-827-5. ^ a b Ellis and Ellis, p. 219. ^ a b c Miller and Miller, p. 80. ^ Miller and Miller, p. 91. ^ Zang, Mu; Petersen, Ronald H. (May–June 1989). "Endophallus, a new genus in the Phallaceae from China". Mycologia. 81 (3): 486–89. doi:10.2307/3760091. JSTOR 3760091. ^ Long, W.H. ; Stouffer, David J. (Nov–Dec 1943). "Studies in the Gasteromycetes: IX. The genus, Itajahya, in North America". Mycologia. 35 (6): 620–8. doi:10.2307/3754905. JSTOR 3754905. ^ Saenz, JA (1980). "Ligiella, a new genus for the Clathraceae". Mycologia. 72 (2): 338–49. doi:10.2307/3759257. JSTOR 3759257. ^ Miller, O. K.; Ovrebo, C. L.; Burk, W. R. (October 1991). "Neolysurus: A new genus in the Clathraceae". Mycological Research. 95 (10): 1230–4. doi:10.1016/S0953-7562(09)80016-6. ^ Miller and Miller, p. 83. ^ Imai, S; Kawamura, A (1958). "On the Japanese species of Protubera". Science Reports of the Yokohama National University. 2 (7): 1–6. Ellis JB, Ellis MB (1990). Fungi without Gills (Hymenomycetes and Gasteromycetes): An Identification Handbook. London: Chapman and Hall. ISBN 0-412-36970-2. Miller HR, Miller OK (1988). Gasteromycetes: Morphological and Developmental Features, with keys to the Orders, Families, and Genera. Eureka, CA: Mad River Press. ISBN 0-916422-74-7. Wikimedia Commons has media related to Phallaceae.